DOES FRAGRANCE HAVE A SOUL? - Ultra International B.V.Ultra International B.V. DOES FRAGRANCE HAVE A SOUL? Exclusively written for Ultra International BV. The perfumer’s palette comprises a very wide range of raw materials. Both synthetic and natural ingredients are essential to the creation process. The more complex and subtle features of natural ingredients enrich the olfactory quality of a fragrance, adding opulence, volume and strength. Perfumes that contain natural raw materials in their formula often have more character. These fragrances are more sophisticated, with a true identity and a unique olfactory signature. In each olfactory family, perfumers tend to treasure particular natural ingredients for their own reasons. Highly volatile citrus notes are often used in top notes because they tend to evaporate fast. For Vanessa Prudent, perfumer for Argeville, citrus essences create a very pleasant energising, uplifting effect from the start. Essential oil of mandarin is highly appreciated by numerous perfumers, including Laurent Verlaque, perfumer for Expressions Parfumées, since its scent is very close to the soft, sweet pulp of the fruit. The mandarin has a sunny, luminous, stimulating effect. Fragrances that contain mandarin are sparkling and joyful! Lavender is a natural ingredient that has been used in perfumery for a very long time. This native Mediterranean plant was used by the Romans to perfume their baths and preserve linen. Nowadays, lavender is harvested mechanically and not by hand as with rose or jasmine. The yields are superior. That is why lavender is one of the least expensive natural essences used in perfumery. Today, essential oil of lavender is used widely in asculine fine fragrances. In fact, it is one of the basic elements in the fougère accord. According to Stéphane Garavagno, perfumer and president of Parfums Plus, lavender brings freshness and timeless elegance to fragrances. In aromatherapy, lavender is also well known for its soothing, relaxing virtues. The opulent and comforting scent of orange blossom has been appreciated since ancient times. Orange blossom absolute brings warmth and well-being thanks to its honeyed notes. For Florie Tanquerel, perfumer for Cosmo International Fragrances, the velvety effect of orange blossom brings harmony and femininity to fragrances. In the floral family, the rose is one of the noblest raw materials of the perfumer’s palette. This sublime flower has been used in perfumery for thousands of years. Its intense sweetness symbolises love and passion. The tuberose is one of the most fragrant plants in the world. Today this characterful white flower is mainly cultivated in India and Egypt. Its milky notes, exotic ylang-ylang hues and smooth orange blossom inflections make for an intense and heady scent. Laurent Verlaque appreciates the opulence of this beautiful floral note, its richness, and its bewitching and captivating effect. Perfumer Vanessa Prudent loves the tuberose for its interesting combination of solar and green floral notes. The everlasting flower grows wild in the South of France and especially in Corsica. It has a strong personality and reveals from the start a curry scent. This pretty plant with yellow flowers goes on to release other odours close to rose and camomile. The spice realm includes cardamom from Sri Lanka and southern India. This spice is highly appreciated by perfumers for the strength yet delicacy of its smell. The charm of cardamom is characterised by elegance, discretion and freshness combined with an exotic spiciness. For Vanessa Prudent, cardamom has the power to enhance an accord and brighten up her fragrances. Pink pepper scent is at once very spicy and delicate. Piquant and strong, it is also very smooth, making it highly appreciated by perfume creators. Anaïs Fournial considers pink pepper as a ‘great lady’. She describes this stunning spice as powerful, explosive and ultrafeminine, and readily includes it in her creations. The timur berry is also surprising because it develops fresh, sparkling citrus hints, such as pink grapefruit. Its light, herbaceous effect with a fruity touch of mango is totally astonishing! From a botanical point of view, allspice (hot pepper of Jamaica) is close to black pepper. Thanks to its very powerful spicy scent, it provides fragrances with unusual depth. Florie Tanquerel appreciates its cinnamon and clove notes because they illuminate her compositions. She associates it divinely with the smooth warm notes of cocoa. Finally, vanilla is also a spice comprising hundreds of different fragrant molecules. When associated with other scents, vanilla may reveal a floral, spicy, sensual, hot, or woody side. According to Stéphane Garavagno, whatever it is associated with, vanilla remains decidedly dazzling, irresistibly feminine and sensual. It is an infinite treasure! In India, cypriol, also called nagarmotha, has been used as a fragrance since time immemorial. In fact, the roots of this plant were used to perfume women’s clothes including traditional saris. The particularly persistent scent of cypriol is woody and earthy. Florie Tanquerel adds cypriol to her fragrances because it brings an intensity right from the top notes along with animal and leathery facets. A native of Indonesia, patchouli is an absolutely indispensable ingredient for building a chypre accord, which is mainly composed of bergamot, jasmine, oak moss, rose, labdanum and of course patchouli! One of the most expensive natural essences in the world is oud, an ingredient with a very strong character. Its woody, leathery, animal notes are ultra-powerful. Some perfumers, like Florie Tanquerel, who are particularly fond of fragrances from the Middle East, like to use it either in trace or in overdose depending on the project. Majestic and precious Indian sandalwood is increasingly rare and thus more and more expensive. It releases an extremely smooth and velvety woody scent. Its notes are warm, sensual and slightly animal. Its odour is simply bewitching. The creamy gourmand facets of sandalwood make it a firm favourite of perfumer Stéphane Garavagno. Lastly, the elegance and strength of vetiver seduce fragrance creators who appreciate its woody scent with lightly smoked notes. The plant’s smell evokes the earth and plant matter. Laurent Verlaque particularly appreciates a special quality of vetiver that goes beyond its woody elegance and opens up a fresh, sparkling grapefruit facet. Incense, with its precious and spiritual combination, has existed since Ancient Greek times, when it was used in religious rituals. Along with myrrh and gold, incense was one of the gifts offered by the three kings to the infant Jesus. 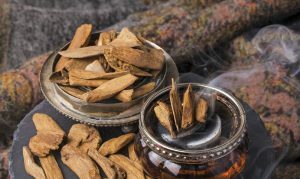 Throughout history, people have burned the bark of incense to release its highly magical scent. Its strong odour is magnificently ambery, spicy and even peppery. It can conjure up dusty wood that has just been polished, or the inside of a church. Incense lends fragrances a spicy smell from distant lands, combining mystery with a strong character and a power of seduction. To conclude, we might draw a parallel with painting: natural raw materials bring more nuances to perfumed compositions. They give colour and make fragrances livelier. They illuminate perfumes and bring radiance. Whatever the proportions used, natural raw materials lend life to perfumers’ creations. Natural ingredients give a soul to their fragrances.